They have a dessert train (think: sushi train but with cake! ), which we thought would be a bit of fun, but there was a huge queue and we were tired. Instead, we bought a selection of cakes and macarons from the super pretty, whimsically-designed, retail section, and brought them back to the hotel to eat with tea. Yay for holiday indulgences! The macarons (or "Zumbarons", as he likes to call them) all looked beautiful, and the shells had a great texture - nice and soft, with only a slight crunch. 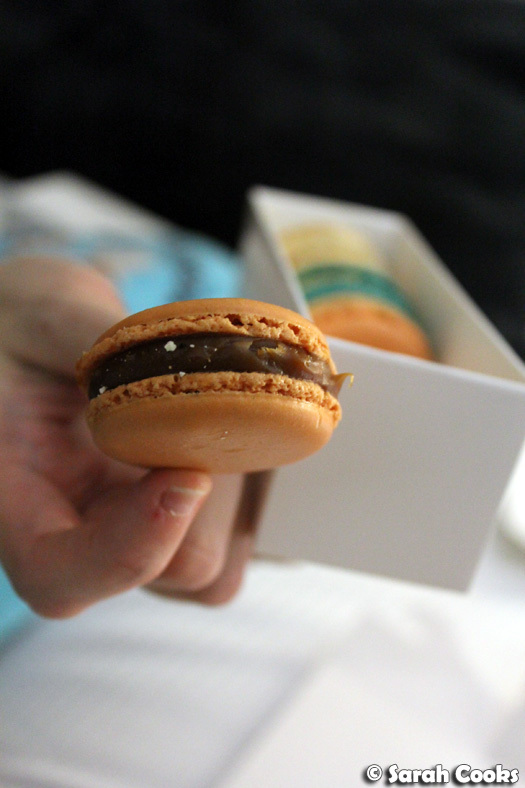 We were really impressed by the peach ice tea macaron: it had a lovely pure peachy flavour. However, we weren't really enamoured of the others - the buttercream filling of the malted milk macaron, for example, had an odd, slightly curdled texture, and wasn't particularly malty. 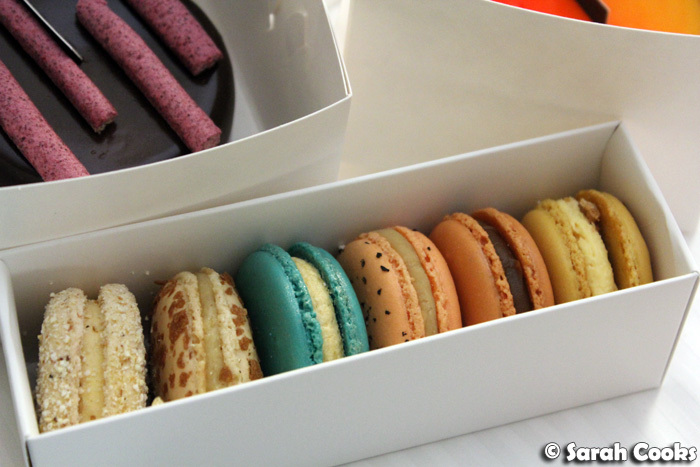 Overall, we agreed that the macarons we tasted were made with novelty in mind rather than taste! I think they were all made skilfully, but the odd flavours just didn't work. 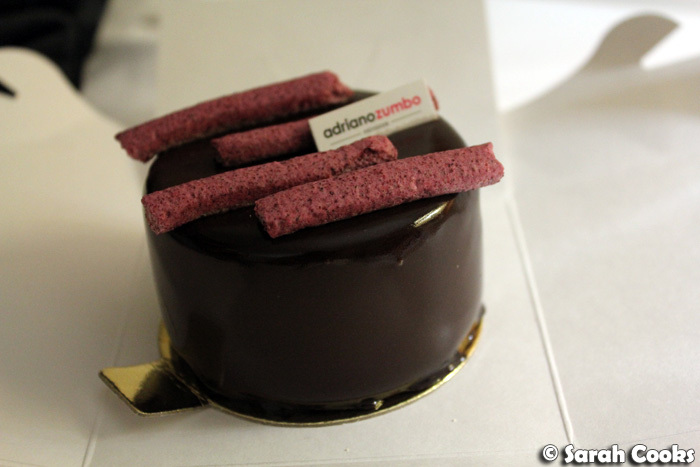 If I were to go back to Zumbo, I'd definitely go for simple, classic flavours! 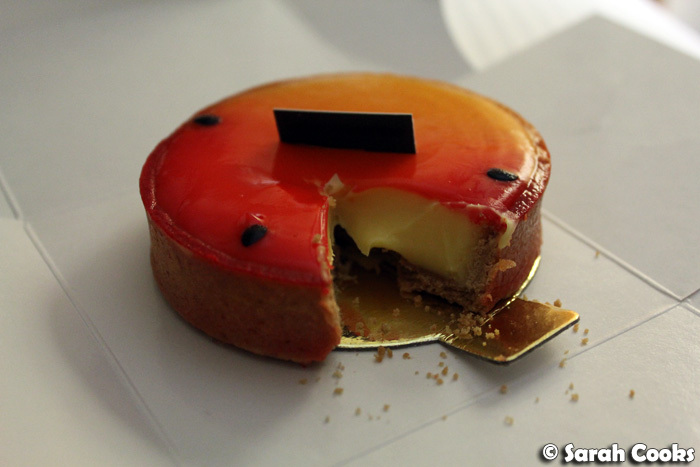 I nearly ordered the St. Honoré myself, but after tasting a bit of An's one, I'm glad I didn't. It looked beautiful, and the description sounded promising - pâte sablée and sablé breton in the one dessert? Yes please! - but again, the flavour combination wasn't great. Between the piped nougat crème chantilly and choux puffs were some little jelly (?) pieces that had a strong floral flavour, almost like lavender. I think I'd have much preferred a classic St. Honoré gateau! A much more successful choice was the chocolate mousse. Look at that super shiny chocolate coating! So shiny! Underneath that perfect coating was a lusciously light-textured chocolate mouuse, a flourless chocolate sponge and some berries, which provided a nice refreshing contrast to the rich chocolate. My choice was one of the more "boring" ones: a simple passionfruit tart. I really liked it - the sweet pastry was pleasingly crisp, and the filling had a wonderful smooth texture. Sandra found it overwhelmingly eggy, but I thought it was a well made tart. 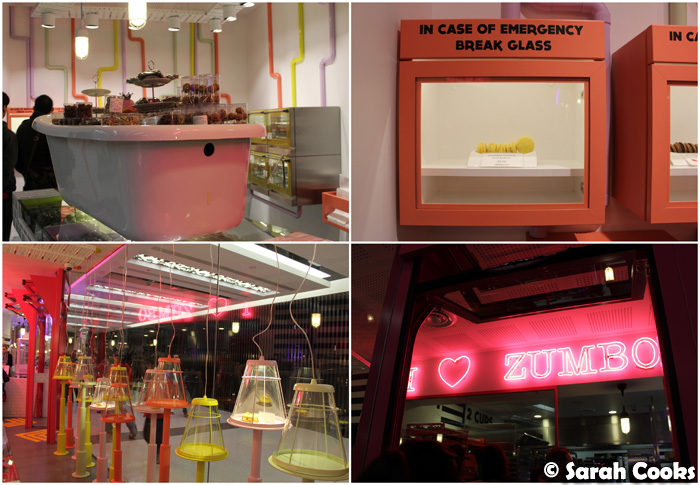 And that was our Zumbo experience! After all the hype and publicity surrounding the patisserie, I'm definitely glad we got a chance to try it, and it was so fun to visit the store! 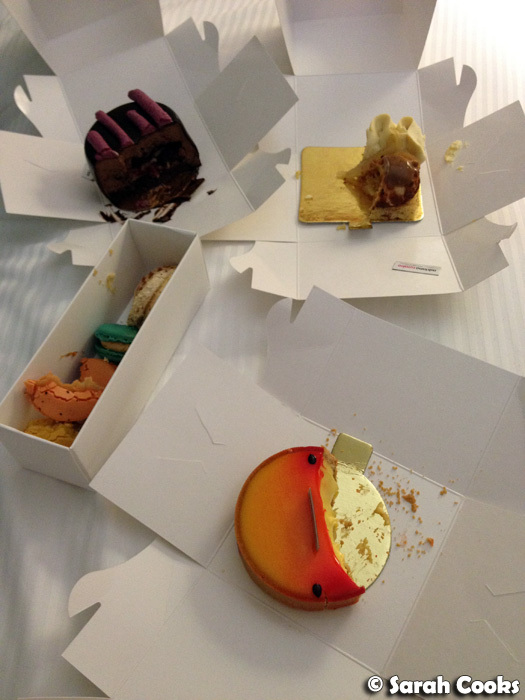 (And to eat the cakes in our hotel room, hehe). However, we weren't blown away by the quality of the product. Whilst they were all skilfully made (as evidenced by the lovely textures and gorgeous presentation) most things we tried seemed to be made with prettiness and wackiness as a priority, rather than taste. Admittedly, I generally do prefer a more rustic, homestyle type of pastry, but if I am blowing out (the wallet and the waistline) eating those perfect, high-end French-style cakes, I want them to be perfect. (You know, like Ladurée or Pierre Hermé). 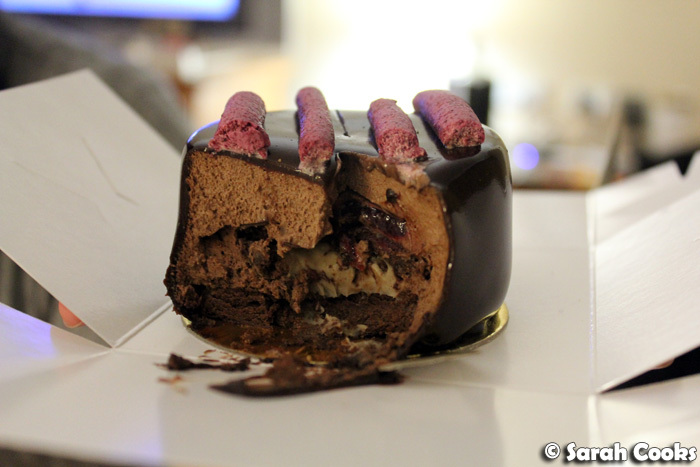 Closer to home, I think Burch and Purchese do an amazing job and would definitely choose them over Zumbo any day. This is the third post in my 2012 Sydney Trip series. Ames - Thanks for your comment! I *love* passionfruit, and the pastry on that tart was really, really nice! Yeah... 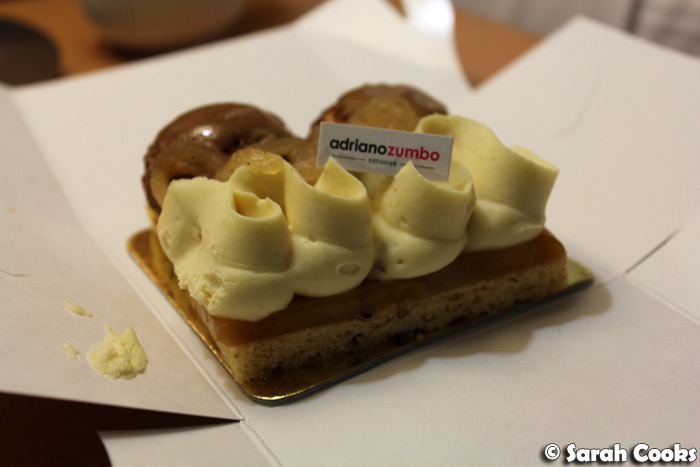 I didn't like Zumbo. Over-hyped. What good is a tart that is pretty but doesn't taste nice? The chocolate one was way too dark for me, An's one I didn't like at all, and the passionfruit one was too eggy. Great that you got to try it! :) I still love the cakes, the wheelie ones are so good with their crunchy and soft textures. Totally agree with you. I prefer simpler cakes too in general. But when I want high end fancy, it has to be done perfectly like ones from France. 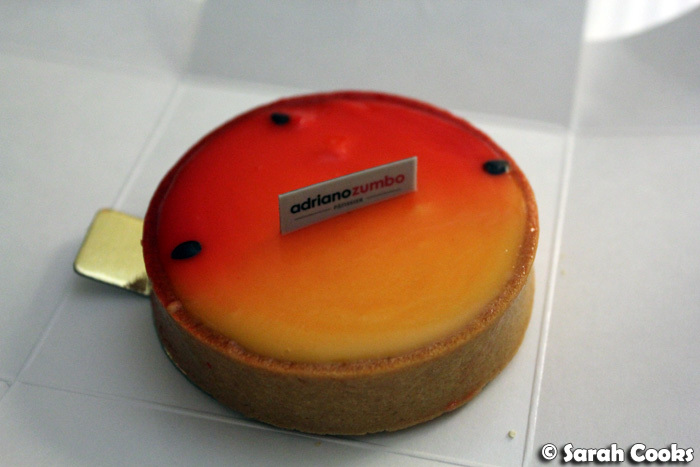 The Zumbo ones just miss the mark on a number of aspect in terms of taste.